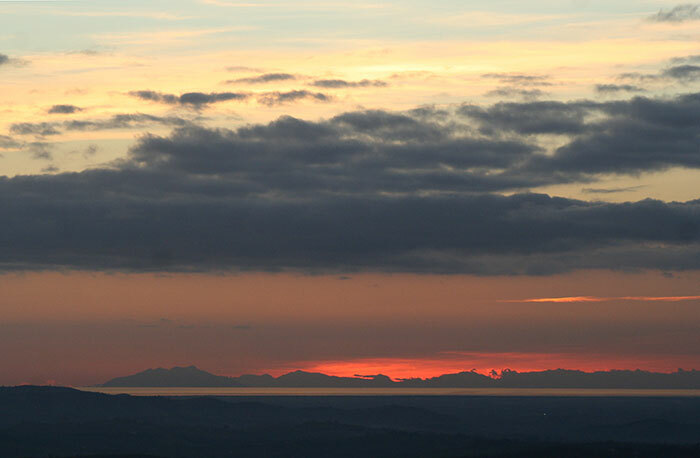 Just across the border of the Val d’Orcia, but still within the spectacular panoramic scenery of this World Heritage site, is the walk from Montepulciano to Montefollonico and Il Tondo, an interesting panoramic stop. Montepulciano is perched on a hill and the entire town slopes at a steep gradient culminating in the magnificent Piazza Grande which houses the Communal Palace and the main cathedral. The town offers many interesting medieval and Renaissance churches, and buildings to explore along with narrow side streets and alleyways that take you to magnificent viewpoints of the surrounding countryside. If you start hiking from Piazza Grande, go down following Via Ricci until you get to an intersection of three streets. Turn left under an arch where you should see a sign, “San Biagio”, and keep walking down, straight ahead as your road zigzags down to an arch, one of the former city gates. 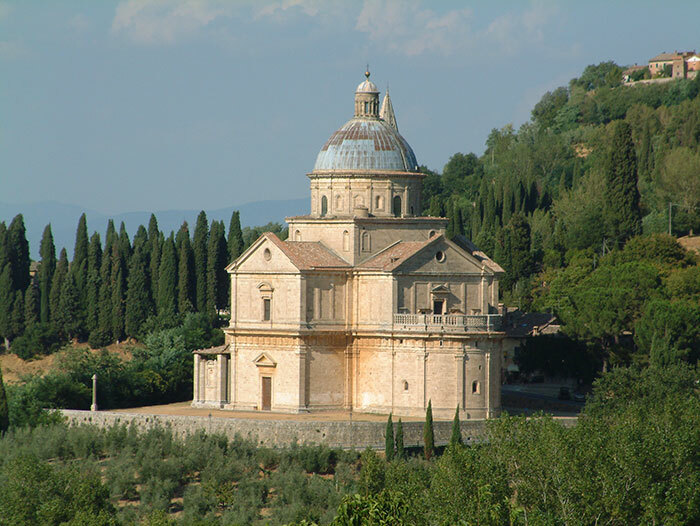 A steep 20-minute downhill walk from Porta dei Grassi takes you to the photogenic Tempio di San Biagio, a travertine Renaissance church designed by Sangallo in the XVI century. 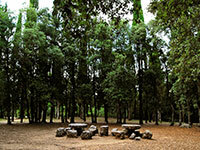 From here you walk through the overwhelming scenery of the Val d'Orcia towards Montefollonico. 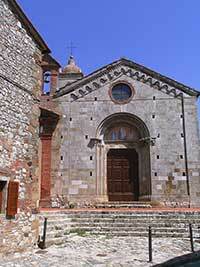 There is good parking for cars or campervans near the Church of San Biagio. Starting your hike here is a good option (and the directions of our gpx file). If you prefer to start this itinerary from Montepulciano’s Piazza Grande, enter the city through the main street of Montepulciano, the Via di Gracciano nel Corso which stretches for 11.5 kilometers from the Porta al Prato to the Piazza Grande at the top of the hill. One of the highest of the Tuscan hill-towns, Montepulciano is built along a narrow tufa ridge, with a long main street and alleys that drop away to the walls. 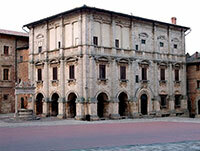 The Piazza Grande is built on the highest point of the ridge. 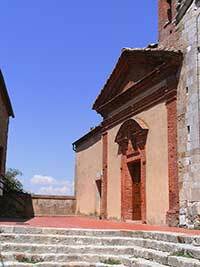 Start in Montepulciano’s Piazza Grande and take the panoramic path to Porta dei Grassi, where you will encounter the Tempio di San Biagio. Then take the Via dei Canneti until you reach the intersection with Via delle Colombelle. The path follows the mountain ridge and leads you through the Nobile vineyards to the oratory of Sant'Anna in Via dei Colli, in the foothills of Montefollonico. Stop in Montefollonico for lunch. This track also passes the wonderful ruins of the Monastero di Santa Maria, and the magic picnic spot of Il Tondo, east of Montefollonico. From Il Tondo walk down following Via dei Frati towards Montefollonico (you walk around Residence Sangismondo), then left on Via dei Frati and again left on Via dei Giglio. On Via dei Pianelli you can enter the old center of Montefollonico climbing the stairs in front of you, or walk towards Bar Sport (to the right). Bar Sport on Via Pianelli is a good spot for a coffee or a refreshing drink. Here the locals watch tourists passing by. 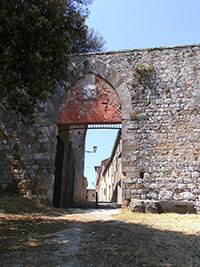 In front of Bar Sport, you can enter the historical medieval center of Montefollonico through Porta del Pianello. A lunch in one of the two excellent restaurants (Ristorante La Chiusa and Osteria La Botte Piena) in Montefollonico is recommended. The unusual Basilica di San Biagio built by Sangallo in the XVI century [Photo, Josep Renalias]. From Piazza Grande, go down following Via Ricci until you get to an intersection of three streets. Turn left under an arch where you should see a sign, “San Biagio”, and keep walking down, straight ahead as your road zigzags down to an arch, one of the former city gates. Ruderi del monastero di Santa Maria, Montefollonico. Arco del portale che si apre sul muro perimetrale. Ruderi del monastero di Santa Maria, Montefollonico. Particolare della cornice di uno dei pilastri quadrilateri delle archeggiature di valico. 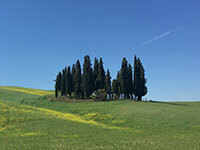 Immerse yourself into the rhythms of la dolce vita on an unforgettable journey through the Val d’Orcia, explore the winding cipress roads and architectural wonders around San Quirico d’Orcia, Pienza and Montalcino with our Hiking suggestions. Photo by Rowan Heuvel insolitus, licensed under the Creative Commons CC0 1.0 Universal license.